This weekend, I picked up this old dado / grooving plane at a yard sale. I find it rather interesting in that it is equipped with an angled cutting iron approximately 5/8 inch wide. All of this type of tool I’ve ever seen have had a straight iron set at an angle. I suspect this could possibly be a home-made affair in which the owner substituted an iron from a ‘old lady’s tooth’ type of dado plane. If any of you vintage tool fans out there have encountered anything like this, be sure to post a comment. In the meantime, I’m going to hone up the blade and give this thing a test. If it doesn’t work, I just might remove the iron for use in a more traditional dado plane. Very interesting, Ed! Is there any maker’s mark on the blade itself? It almost looks home made. 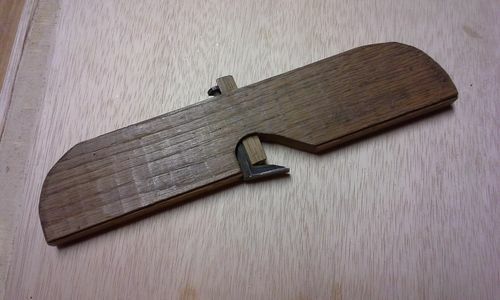 It appears to be a router plane blade in a dado body. If it does not work, you could always use the iron to make a router plane. Thanks for the reminder, Goose.